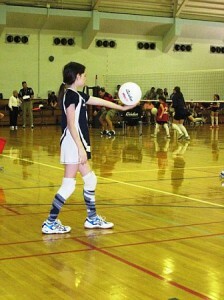 My daughter’s high school volleyball career ended in the state semifinals last week. And dealing with that has been another in a string of dad-challenges as her senior year unfolds and her college days approach. When she was only 5 or 6 years old and I was a high school varsity volleyball coach, I started teaching my little girl to pass a ball. In 3rd grade she played on her first recreation league team, and in 4th grade I became her coach, first in the rec league, and then on club teams. Even after I stepped into the background to cheer as she played for other coaches, I remained my daughter’s personal advisor, unwavering fan, and honest critic. We spent hundreds of hours together reflecting during rides home from practices and matches, and in recent years she actively sought me out during down-time at tournaments for advice when she felt she was struggling. Last spring my favorite player hung up her club uniform, in part because she wanted to end her competitive career representing her high school as the team’s libero through her senior season this fall. And that season turned out to be the ride of a lifetime: They finished 19-3. Regional champions. State semifinalists. Just 3 points short of a trip to the state championship game…and that was the end. We are both making peace with the playoff loss–a match, honestly, that her team probably should have won…but that’s just sports. The most difficult loss is not that match; it’s accepting that a connection we shared for 9 years will never be quite the same. 9 years of tryouts. And practices. And matches. And tournaments. Protecting the floor as a senior. Photo by Nate Pesce, October 24, 2013. Used with permission. Wins. And Losses. Good times. And struggles. All now part of our history. I realize the end of the volleyball season is only one milestone in a senior year that is slowly preparing our entire family for this time next year, when my daughter will be living on a college campus. And whether it comes down to a graduating senior’s final game, final competition, or final performance, I doubt we are the only family working through this type of change. So, to borrow from The Player in Tom Stoppard’s Rosencrantz & Guildenstern Are Dead, I suggest that we–the parents of high school seniors and our seniors themselves–need to “look on every exit being an entrance somewhere else.” ‘Somewhere else’ is going to be great–but so was the scene we just left, and getting used to moving forward is going to take a little time.